Come experience our newly renovated guest rooms completed January 2017. The Hampton Inn Orlando Near Universal Blv/International Dr hotel in Orlando Florida is located one mile south of Universal Studios off International Drive. Orlando Florida area attractions include the Orlando Convention Center outlet malls Sea World Universal Studios Epcot and Disney Theme Parks. Within half a mile of our hotel you can dine at Aashirwad Fine Indian Cuisine Pizza Extreme Pio Pio Spanish or Red Lobster. At the Hampton Inn Orlando Near Universal Blv/International Dr hotel in Florida we feature 169 guest rooms a fitness center and an outdoor hotel pool. Amenities include complimentary hot breakfast in-room mini-microwave refrigerator coffeemaker hair dryer iron with board TV with cable and complimentary scheduled shuttle service to Universal and Disney Theme Parks. 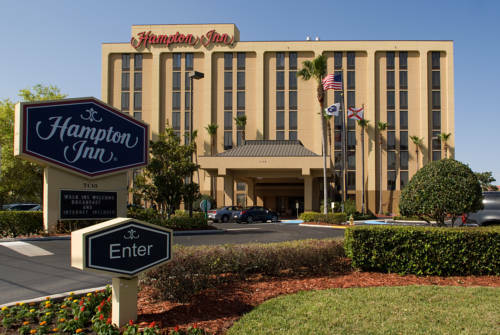 Our Hampton Inn hotel in Orlando Florida also offers adjoining rooms and cribs. Laundry/valet services and pay per view movies are available. We love having you here at the Hampton Inn Orlando Near Universal Blv/International Dr hotel in Florida.